Tue., July 3, 2018, 11 a.m. Struck by a ship, entangled in crab pots, stillborn, emaciated: It’s been a tough three months for whales. Since April 3, whales — mostly grays, and humpbacks — have been entangled and/or stranded on the beach in Oregon and Washington in numbers not seen in nearly two decades, with 16 cases of large whale strandings so far, compiled by the National Oceanic and Atmospheric Administration’s (NOAA) Office of Protected Resources. That is the most strandings in Washington since 1999-2000, when there was a big spike in dead whales all along the West Coast. This season, as then, scientists have counted many emaciated calves among the dead in Washington. Among the lost so far this season: a 31-foot-long yearling gray whale that was hit by a ship and washed ashore on Thursday, dying hours later. 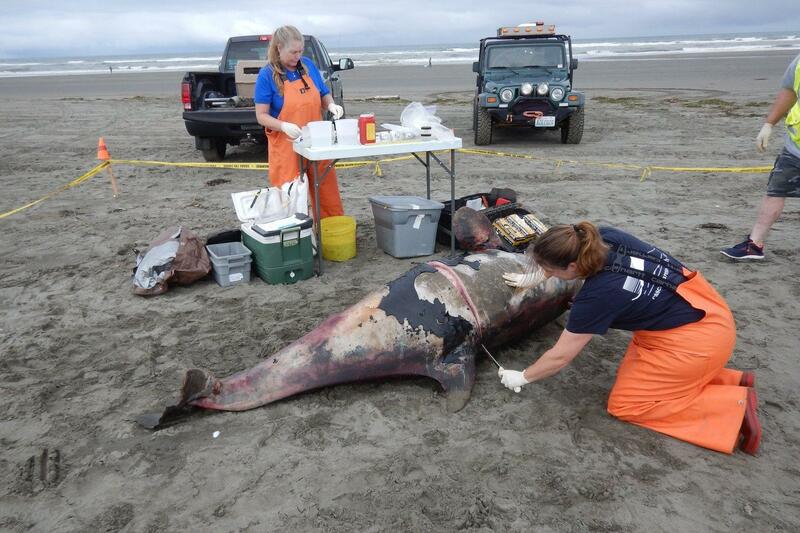 A dead orca calf also washed up in Ocean Shores over the weekend. Jessie Huggins, of the Cascade Research Collective in Olympia, did a full necropsy on the orca Sunday morning. She said genetic analysis will determine within a few weeks if the baby was a member of the southern-resident orca pods, critically endangered and so far with no successful pregnancies for the past three years. “I’m glad it was quick at that point, for the animal’s sake,” she said. “This is definitely a high mortality year for grays,” said John Calambokidis, of the Cascadia Research Collective. But it is nothing like the losses in 1999-2000, when the population appeared to reach carrying capacity and 651 grays died from Mexico to Alaska. If the pregnant females can’t get at their food source in the Arctic, it shows in the decline of birthrates the following year. The average for Washington and Oregon is about three to four whales entangled each year, and this year there have been seven already, Wilkinson said. The increase holds true along the West Coast, said Justin Viezbicke, NOAA’s stranding coordinator for California. Published: July 3, 2018, 11 a.m.